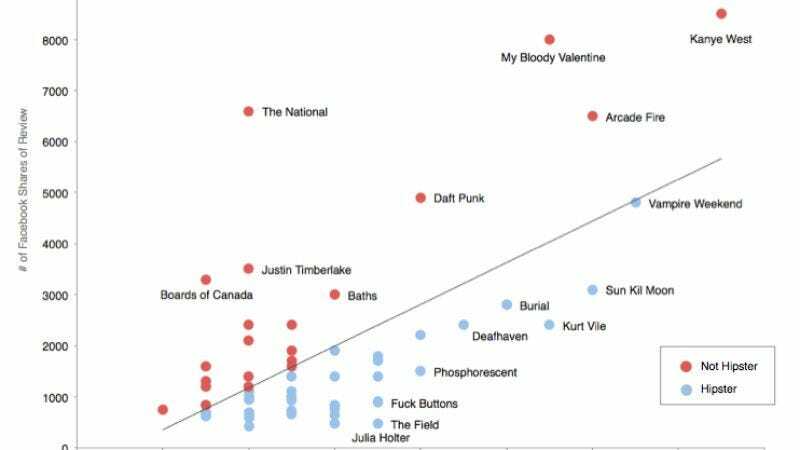 Determining which music is the “most hipster” has long been plagued by ambiguous methodology, such as reading the comments on any single article ever posted about any band ever. While that can lead you to the safe, blanket conclusion that the mere act of listening to recorded sound is incredibly “hipster,” figuring out which sounds are the most hipster has traditionally eluded us, causing endless debate—a pursuit that is itself ironically “hipster.” But now the data-miners at Priceonomics have devised a mathematical formula to help you determine which bands are the most egregious examples of that vaguely applied term, so you can more easily avoid them and get back to listening to non-hipster sounds, like fire trucks. The site also developed a more extensive breakdown of the 25 biggest “hipster” bands, whose obscurity is such that you can safely listen to them or put them in your Best Of album lists without fear of losing your edge. And finally, there’s the “Beer Me Bro” index, which lists the 25 bands who, oh really, Arcade Fire? Let me guess: Your MySpace page says you love “Rap, Dance, Country All Kinds of Music :P LOL,” and also you have a MySpace page. Priceonomics also notes that it was unable to determine whether it’s “okay to like Vampire Weekend,” leaving that to tomorrow’s scientists to discover through repeated trials of sniping at each other.